As a Continuing Care Retirement Community (CCRC), Elm Terrace Gardens provides independent living, personal care and nursing care as well as healthcare and supportive services all under one roof. Residents benefit from an active lifestyle and gain peace of mind knowing that their future needs will be met. In fact, two recent studies found that seniors who live in CCRCs are more satisfied in their daily lives and are healthier and happier than those seniors who remain in their own houses* [American Senior Housing Association study]. 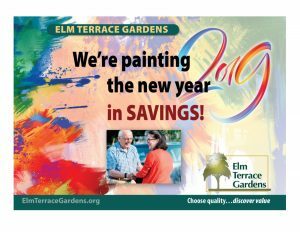 With a rich 36 year history as a Continuing Care Retirement Community (CCRC) in North Penn, you are bound to see a familiar face at Elm Terrace Gardens! Don’t hesitate, let us know what you’re looking for today! We provide options and are extremely agile in adapting to your changing needs and economic circumstances. As a Lifecare Contract holder, Elm Terrace Gardens provides these three levels of care that are available if you need it, when you need it, and without an increase in your monthly service fee. A Lifecare Contract is like a built-in insurance policy! The benefit of our Fee for Service Plan is that you only pay for the services you use. This plan has a small community fee that is completely refundable and may be used for future health care services, returned to the resident or to their estate. Unlike members of the outside community, you are given priority access to our healthcare facilities should you need them. When you select Elm Terrace Gardens for your retirement, you are able to enjoy a variety of services and a rewarding lifestyle while only paying for the services you use. Our Fee for Service plan has a community fee that is completely refundable and may be used for future health care services or returned to the resident’s estate.